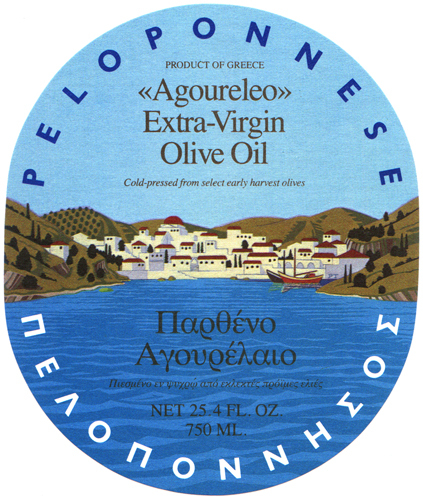 Label for Peloponnese Extra-Virgin Olive Oil. Illustration by Peter Thorpe. 1983 Peloponnese Olive Oil label on bottle. Illustration by Peter Thorpe. The labels for Peloponnese products were originally produced in 1983, when Peloponnese was a small start up food import company based in Berkeley, CA. Design Director: Michael Grossman. Design: Michael Grossman. Illustration: Peter Thorpe.